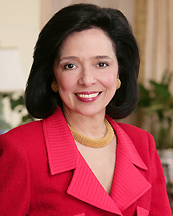 NEW YORK, Oct 12, 2011/ FW/ — Dr. Joyce F. Brown, president of the Fashion Institute of Technology (FIT), has been recognized for her contributions to the arts and education by two organizations. Dr. Brown will receive The Town Hall’s Friend of the Arts Award on October 16 at The Town Hall’s gala at the Princeton Club of New York. The award is presented annually to individuals in appreciation of their abiding interest in the development, enrichment, and support of the arts. Judith Jamison, artistic director emerita of Alvin Ailey American Dance Theater, will also receive this award. On September 6, Dr. Brown was presented with the Fashion Island Outstanding Educator Award from the Staten Island Economic Development Corporation for her work at FIT. The Town Hall will affix a bronze plaque with Dr. Brown’s name to a seat in the theater to commemorate the occasion, and a photograph of Dr. Brown will be displayed in The Town Hall Friends of the Arts Gallery. The Town Hall, which is celebrating its 90th year, has presented the award annually since 1981. Previous awardees include Tony Bennett, Dizzy Gillespie, Elaine Stritch, Wendy Wasserstein, Bobby Short, Mortimer Zuckerman, Jacques d’Amboise, Laurie Tisch, L. Jay Oliva, Vartan Gregorian, Jane Alexander, Agnes Gund, Lewis Rudin, Eli Wallach, Marilyn Horne, Joseph Papp, Beverly Sills, Helen Hayes, Celeste Holm, and Dina Merrill. A highly regarded educator and academic administrator and a strong advocate for public higher education, Dr. Brown previously held senior administrative posts at the City University of New York (CUNY), including acting president of Bernard Baruch College and vice chancellor of the university. She also was professor of clinical psychology at the Graduate School and University Center of CUNY, where she is professor emerita. Dr. Brown served as a New York City deputy mayor for public and community affairs during the David Dinkins administration. Dr. Brown earned her doctorate and master’s degrees in counseling psychology from New York University and her bachelor’s degree from Marymount College in Tarrytown, NY, where she served as a trustee from 1994 to 2000. She received a certificate from the Institute for Educational Management at Harvard University. Dr. Brown serves on selected corporate boards and is active in numerous community, civic, and professional organizations.